1. Say NO to cramming: Study in 20-50 minute increments and give yourself 5-10 minutes in between. By distributing learning over time versus cramming, you will typically gain more long-term retention of the material. 2. Say YES to cardio: Research shows that just 20 minutes of cardio can improve your memory. Whether you opt to dance, jog, walk, bike or swim, exercise will increase your energy level and reduce the effects of stress. 3. Eat superfoods/antioxidants: Everybody knows you should eat breakfast the day of a big test. Cameron Holloway, a senior clinical researcher at the University of Oxford suggests that high-carb, high-fiber, slow-digesting foods like oatmeal are best (oatmeal is more filling than cereal) and that eating a balanced diet that includes fruit and vegetables helps your brain hold steady. 4. Alternate study spots: Shake up your finals routine! Spending all night in the library can be draining. According to the New York Times, simply alternating the room where a person studies improves retention. Why? Supposedly, the brain makes subtle associations between what it is studying and the background sensations it has at the time. Try alternating your study spots between the library, a study room, and a quiet coffee house. 6. Avoid the all-nighter: According to a 2008 study by Pamela Thacher, Associate Professor of Psychology at St. Lawrence University, all-nighters impair reasoning and memory for as long as four days resulting in lower grades. According to Dan Taylor, director of a sleep-and-health-research lab at the University of North Texas, you should review the toughest material immediately before going to bed the night prior to the test. It makes it easier to recall the material later. 7. MINIMIZE distractions: Research shows that while many students prefer to study while listening to music, texting friends, or watching television, they are less likely to retain information that way. If you must listen to music, stick to instrumental music and consider downloading these study tools to keep you focused! Use these study tips to create and implement your own survival plan for finals week this semester. Need help or encouragement? 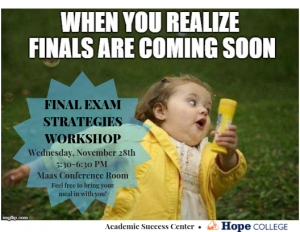 Stop by the Academic Success Center in VanZoeren 261 for you own personalized study session. ASC Study Tip- LOTS of FREE Resources on campus! Review & Reflect Regularly- What’s working? What’s not? Make a plan to adjust. Don’t wait until you are doing poorly to seek out help- seek out resources before it’s too late to turn things around! Posted on February 1, 2019 February 4, 2019 Author Suzette StaalCategories ASC, Disability, Disability Services, Study strategies, TutoringLeave a comment on ASC Study Tip- LOTS of FREE Resources on campus! 1. Divide up your time. • Spend Time Studying for the Exams that Carry the Most Weight. • Focus Your Time on Difficult Classes – spend the majority of your time on the classes where your grade is borderline. • Get a good night’s SLEEP! Your brain can’t function properly without 7-8 hours sleep a night. • Run stairs or do some jumping-jacks. Exercise gets blood flowing and increases your alertness. • It has been proven that the smell of cinnamon and peppermint can help you stay alert. So chew on some gum if you’re feeling worn out. 3. Remember what you study. • Recite, recite, recite! Recitation will burn facts into your mind. Recite the material out loud until you’re sure that you will be able to recall it. • Decide which information is most important and concentrate on it. Resist the temptation to try and learn all of the important-looking material. • As you go through your notes and textbook find important definitions, concepts and equations. Write them down on 3” X 5” note cards. This will help you identify what you need to know, and you’ll have a handy set of flash cards. The process of rewriting may also help you memorize the content. 5. Eat a good breakfast. • Eat a good breakfast the morning of the exam. Nutritious foods will keep your nerves steady and your brain engaged. Keep your study area clear of items that could distract you. Have necessary materials close at hand. Concentrate! If you suddenly think of something else you need to do, jot it down to put it out of your mind and return to it later. Turn off notifications and anything else that might disturb you. We suggest trying the Pomodoro Technique. Check out another video about this technique and how to stop procrastinating. The 10 Best Pomodoro Apps! Try a Pomodoro session with the College Geek. Most effective studying is active, testing and questioning yourself (not passive like just re-reading notes/ textbook) and spaced throughout the week. · Review lecture notes and highlight the key ideas. · Quiz yourself on the key terms in a chapter. · Write a summary of a few paragraphs from an article/textbook. · Read a brief article. · List all the things you have to do later/ tomorrow. Need more ideas? Check out how the ASC can help!